His holiness Mirza Masroor Ahmad, the fifth Khalifa of the Ahmadiyya Muslim Community inaugurated the Masroor Mosque. MANASSAS, Va. — The spiritual leader of millions of Ahmadi Muslims brought his special blessing to a Manassas mosque this weekend. 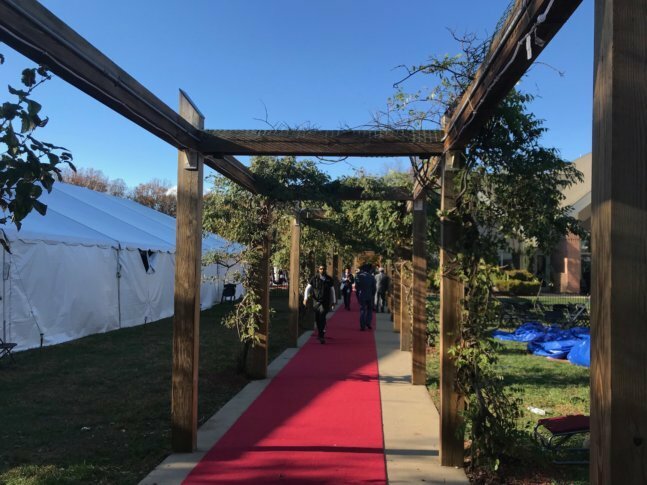 His holiness Mirza Masroor Ahmad, the fifth Khalifa of the Ahmadiyya Muslim Community inaugurated the Masroor Mosque — a sparkling 17-acre site once occupied by the Covenant Manassas Presbyterian Church. For the faithful, the visit was an experience of a lifetime. “Honestly, anything we say in words is less,” said Arsalan Khan, of Woodbridge, a sophomore at George Mason University. “It’s truly a blessed day for us that His Holiness decided to come to our mosque, inaugurate it and bless us,” he said. “A dream come true. We are waiting for this event for three or four years,” said Muzamal Gondal, of Dumfries. Ahmadi Muslims make up a small branch of Islam. It was founded in India in the 19th century. While the larger Sunni and Shia denomination await the coming of the Messiah, Ahmadi Muslims believe he arrived in the person of their founder His Holiness Mirza Ghulam Ahmad, who established Ahmadiyya in 1889. Ahmadis are persecuted in some Muslim countries, including Pakistan, Indonesia and Saudi Arabia. Mirza Masroor Ahmad has been outspoken against violence and extremism, and he has sponsored a number of international peace conferences. Ahmadis believe that religion and government should be separate, so they do not support theocratic forms of government, such as the government of Iran. Followers rolled out the red carpet at the mosque, and children put on their best clothes for the visit of their spiritual leader. “This is a really special day,” said Aroosa Zafar, 12 of Springfield. “It’s a first time for me to see him and meet him in real life and having him in our mosque is a really special thing to me,” she said. At a news conference before delivering a keynote address to his followers, the spiritual leader was asked how the world can achieve peace. He recommended that people think more about others than themselves. “We blame the other person for his shortcomings, for his faults, for his mistakes, but we do not see ourselves … instead of demanding your own rights, you should try to give rights to others,” said Mirza Masroor Ahmad. The visit to the mosque wraps a three-week visit of the religious leader to the United States. He also visited Guatemala.